I was recently interviewed for an article in CMO.com on major trends for marketers in the mobile space. In the interview I discussed the role and scope of digital assistants, though just a few of my more prosaic comments that relate to marketing were quoted. Futurist Ross Dawson, who has been following the digital assistant market for some time, said he expects these technologies will become much more context-aware and better able to offer better responses to user questions. For marketers, this increases the chance of getting their brands in front of consumers, Dawson said. A user asking a digital assistant which brands offer what they’re looking for will hear responses that rely heavily on search engines, as well as what the assistant already knows about the user’s personal preferences. In 2019, expect digital assistants to get smarter and more useful, he added. Much of this is of course not new, I wrote about the rise of contextual search in 2011, and more recently about the massive opportunity for virtual assistants. 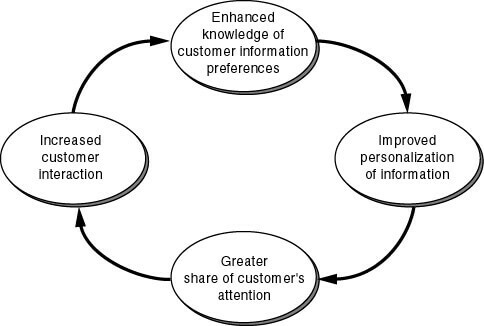 However this also ties back to the themes of my first book on Developing Knowledge-Based Client Relationships, which I applied to customer relationships in Chapter 4 of my book Living Networks, illustrated by this diagram taken from the book on the left. Once virtual assistants understand not just us but the context for our questions and interactions they will become increasingly valuable to us. This will create a form of lock-in, where there is a cost to switching from the assistants that know us the best and are thus able to better personalize our experience. However this requires trust in how that personal knowledge will be used. The winners in the virtual assistant space can only win if they engender sufficient trust for individuals to be happy sharing not just their interactions, but their entire context. The value to users of true knowledge-based context-aware assistants will be massive, but they will only get there by truly earning our trust.